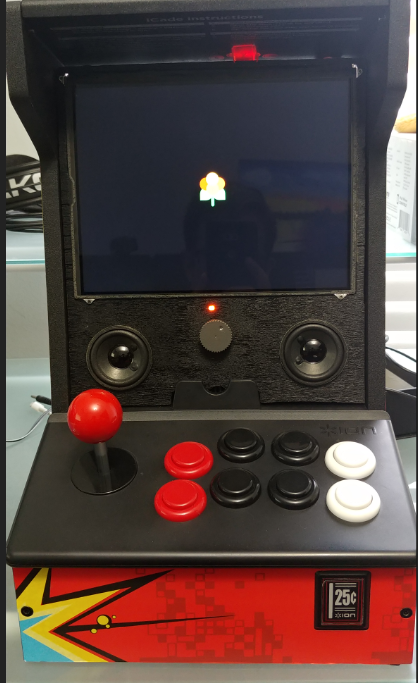 I figured I’d finally blog about my PiCade build I made. To start off this is nothing new, and I got the idea basically from this blog post by PJ. As I don’t have all the pictures I may borrow a couple from his site, well see. 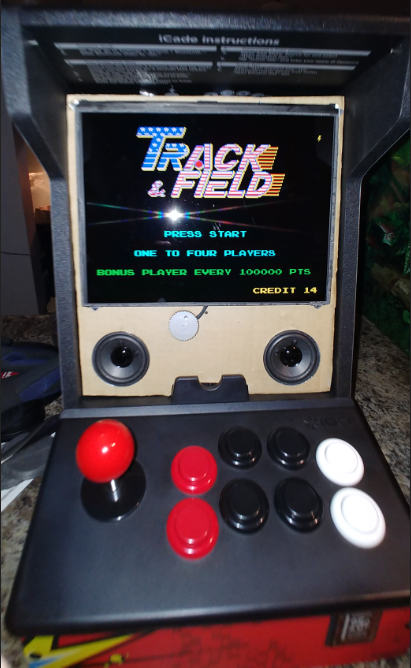 Well first and foremost you’re going to need a iCade cabnet, I found them going for new on Amazon for over $200 (This is way too much), so I managed to get a used like new one off e-bay for a bout $50. At the time of this writing I found a ebay posting for one used as low as $23!! You’ll need an iPad screen, in my case, again had a broken one from work, which I had my colleague rip the screen from it (remember this version the touch screen digitizer is separate from the screen itself). 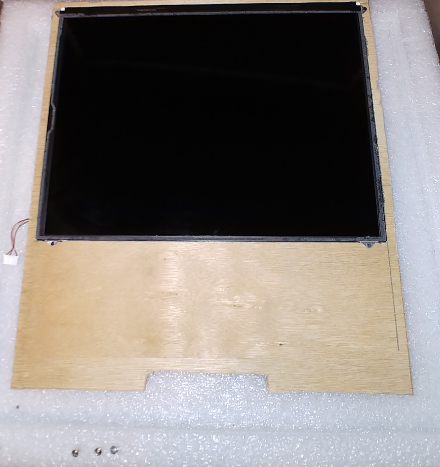 Obviously iPad screens don’t have an HDMI in, so you’ll need to order an LVDS to HDMI converter board something like this I managed to get mine from Alibaba for about $20, it didn’t have a remote or VGA options. I Temp used a MonoPrice Thin HDMI but I had to wrap it around my boards to handle all the excess length, so I ended up buying a 20 CM cable, since I ended up making my build a little more sleek and organized than PJ’s I decided to buy the more expensive slim style 20cm Cable. I got my speakers by disassembling some old USB speakers my work was throwing away, so I managed to get these for free however, you can get amazing cheap USB powered speakers by Logitech for $10 (S-120). Now I use the plywood to mound all the pieces and then slide it into the cabinet like it was the iPad (That’s how sleek I managed to make my build ;)!). You could go the extra mile like this guy in the UK did. Where he drilled holes into the side of the cabinet to provide side buttons ( I love this idea just didn’t have time or the extra higher grade buttons). This would add to the cost of the build but it is a possibility for those who maybe reading this. This section assumes you already have your iPad screen ready to go. In my POC, I had initially placed everything on a cardboard cutout shaped exactly as the amount allowed to be slipped into the cabinet where the iPad goes. Using this cardboard as my template I out my plywood (2 pieces) and then on one of them I cut out the size of the screen, glued the two pieces of plywood together and then mounted to screen to it. Beauty, alright now I cut a small square hole on the backside to allow the LVDS-to-HDMI ribbon cable through the plywood, as you can see it hanging off the left side of the last picture. 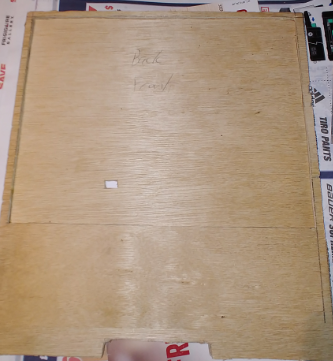 Now on the backside of the plywood is where I mounted all the components. As you can tell from my first template it was a bit messy, and the long HMDI cable is very unsightly. This will be cleaner in the final build with the 20 CM flat HDMI cable. 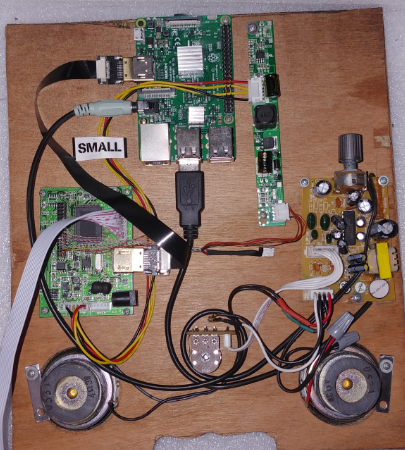 so again using the as my template I started with the video controller board (LVDS-to-HMDI) seen in the lower center. As you can tell I readjusted the board a lil more to the left, and placed the screens LED power module right next to the Pi at the top. You may have also noticed that I precut the holes for the speakers and attached slide anchors, this allows for easy speaker removal and replacement if needed. 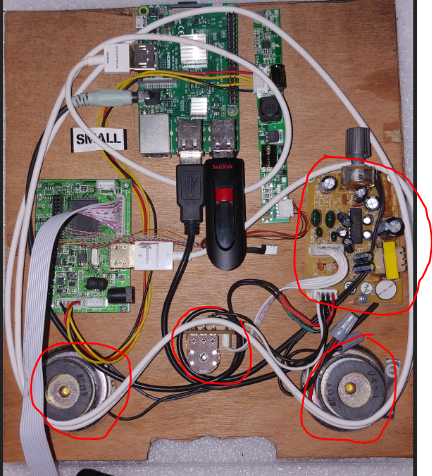 Now in PJ’s build he doesn’t cover the sound much at all other than he states that you need a USB speaker, and from looking at his final build it appears to be that simple little cheesy red dot in the upper left corner of the back of his cabinet. Meh. The UK guy’s is pretty impressive as he installs speakers in the top part facing down which also lights up. 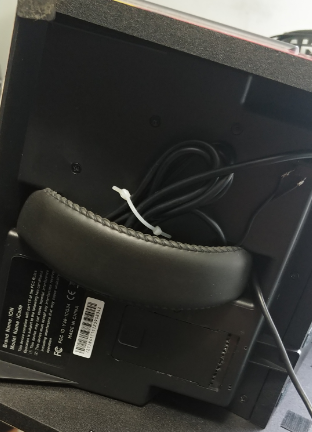 This is very impressive however, it leaves the screen a little on the lower side, which I found is OK only on higher tables, most tables and desk heights I tried I found it more comfortable, with the screen positioned higher on the cabinet. Thus my design places the speakers at the bottom and the screen at the top. As I mentioned I ripped apart some old PC USB speakers from work, these obviously had lengthy cords, so after ripping their plastic enclosures wide open, I shortened the cables and re-soldered them to the main board. 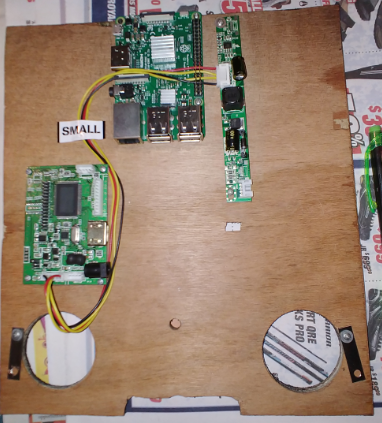 I then proceeded to shorten the speaker wires, mount the speakers in the holes I cut out, anchor them, connect them to the main board, connect that to the pi via the 3.5 mm jack, and power them via the USB slot of the Pi (There’s 4 slots, and 3 of them will be used; 1. Power Speakers 2. Joystick 3. USB Stick for games). I also mounted the potentiometer between the speakers to allow for really easy and rapid volume adjustments. As you can see the wrapping around of the long thin HDMI cable, I was super pleased once I got my high priced flat 20cm HDMI cable… just check out the difference! 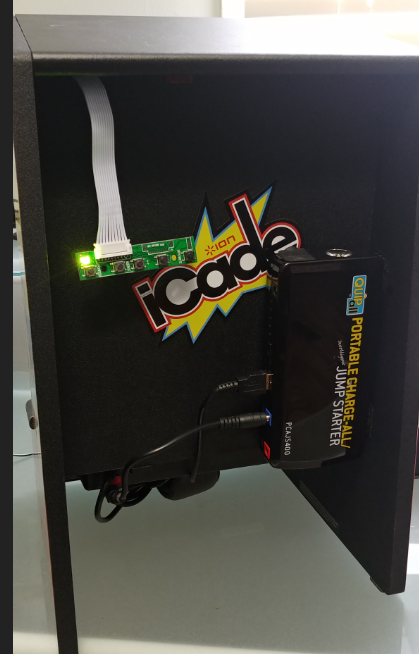 “First up is to get the main case open, which involved about 4 thousand screws, two of which being those awful security types, so be aware that you’ll need a tiny screwdriver just for those if your iCade has them (some don’t apparently). 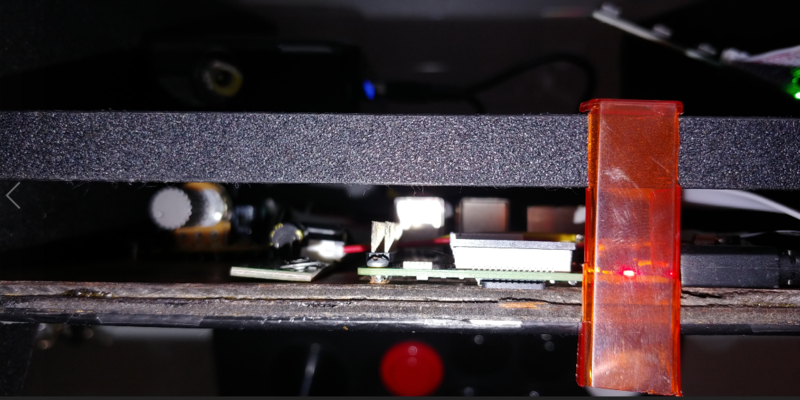 Since I had purchased the USB controller board and I didn’t swap the buttons, it was literally plug-n-play, the only thing I will mention though is, in order to get the unit closed back up I had to cutout the spot where the batteries went, and mounted the USB controller board in it’s place. Then it just came down to using another USB keyboard to bind all the User 1 input controllers under Lakka’s settings. 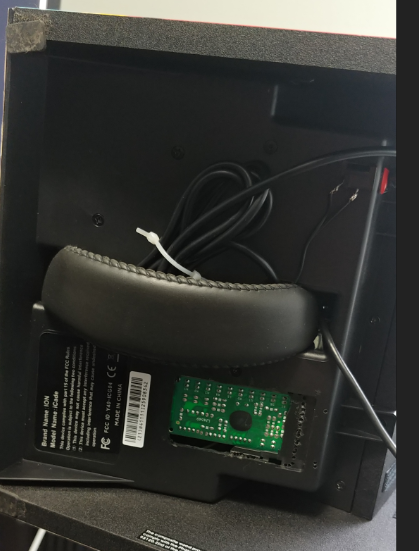 You might have noticed in the last couple pictures that you can’t quite make sense of the cables that protrude from the bottom of the arcade system. 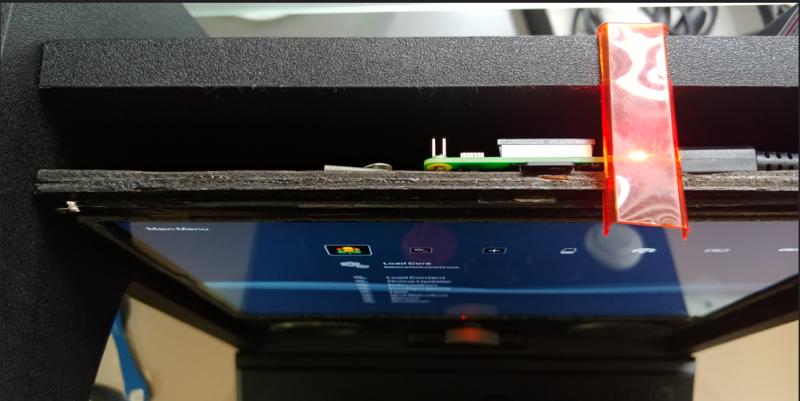 This hole was initially designed to route the iPad power, however since I decided to sneakily hide all the electronics between the iCade backboard and my plywood, I used this hole to route: 1. 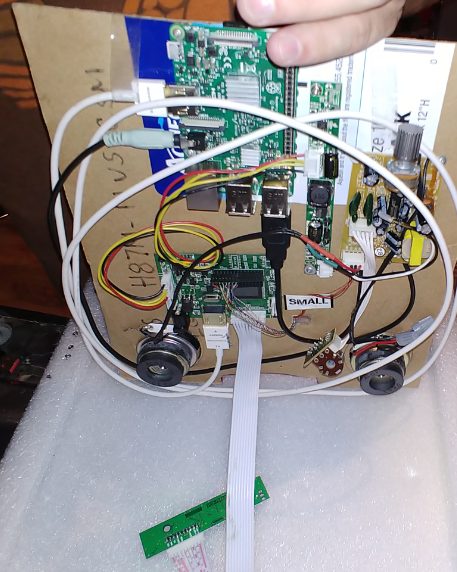 The Pi’s USB power (cable coming out and dropping to the right) 2. 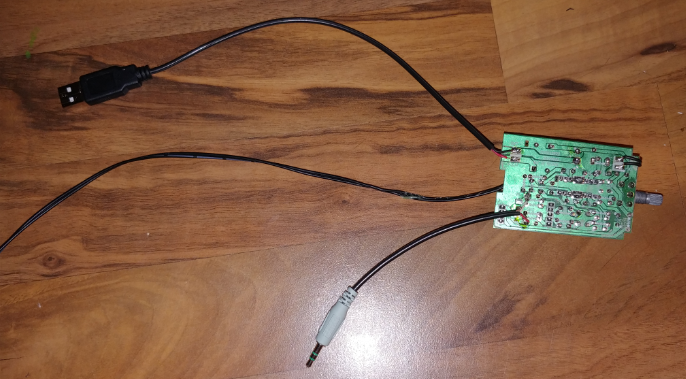 The LSVD-to-HDMI controller board power (The cable going to the top right and you see the open solder points to a female coaxial barrel connector) 3. The Joystick USB cord (From the top right, coiled, and then shoved up into the cabinet. This allowed me some flexibility. 1. I could use my LiPo Car Booster pack to run the system since it has multiple voltage outs (19v, 12v, 5c) and even more conveniently provides power separately to 5v via a USB output. Meaning I had a completely portable bar-top arcade system, with a run-time of about 8 hours. Or 2. replace the LiPo Battery pack with a Nema Extension and Wall Warts much how PJ had his mess setup. Should I ever run out of battery power. Now I might follow up on this blog post with some Lakka specific posts cause there are some interesting nitty gritty’s you have to understand about it, although they do a fairly decent job in their wiki or “doc” section. And a picture of the unit slipped into the cabinet….